An iPhone 5c with touch iD shows up on the iPhone Lightning dock page – iPhone 6C ? If you take a look closely at this image which remains on Apple webpage of the iPhone Lightning dock, you will notice that they show it with an iPhone 5c. 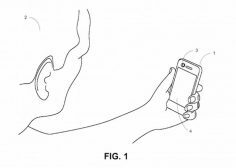 A new patent that would allow a user to unlock its iPhone simply by showing its face towards the iPhone’s came.